That green looking board in the center was so glued on that we had to remove everything down to the joists! This was about the time that Josh swore we would never buy another fixer upper haha. One of the BIGGEST differences was removing not one but both of the ceiling soffits. 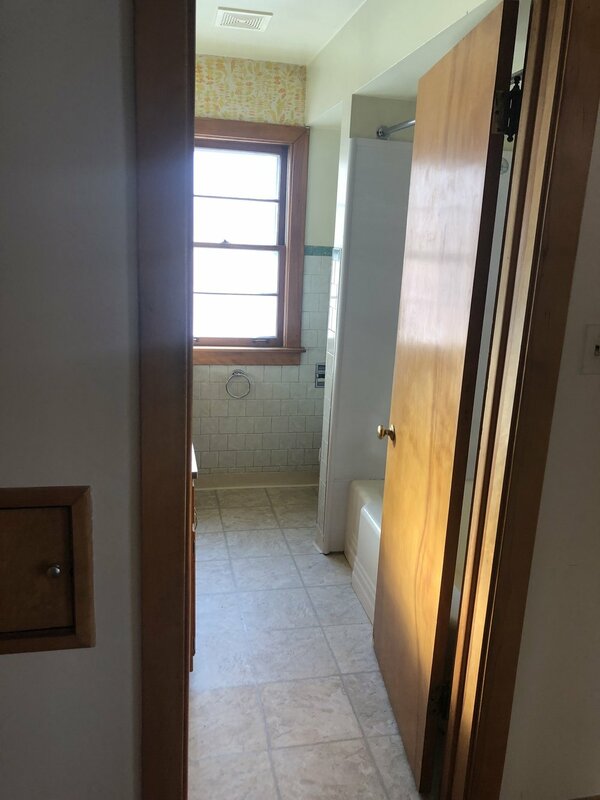 Our bathroom was original to the home so we knew we had to remove both and take advantage of any additional space we could. We have all original plaster walls in our home so once we started removing the soffits, we had to remove EVERYYYYTHING. We had to replace ALL of the plumbing in this house. I will spare you the details of what was in the pipes. We replaced all the plumbing with all copper. This is part of those bathroom remodels that most bloggers won’t share haha. But it’s the reality! It honestly felt like forever for us to get drywall up. My husband and his dad did it together. I know it was a great bonding and learning experience for my husband. But after all of it was finished he said he wish he would’ve hired someone to do it haha. It is very time consuming! One tricky part of this bathroom remodel was measuring out the location of the sconces, electrical outlets, and our vanity. I think we measured over 15 times to make sure everything was accurate haha! Trying to match up all of the brushed brass fixtures was a serious pain in the @$$! I have the worst OCD about everything being perfect in this bathroom that it drove me crazy that our shower head/faucet didn’t match the vanity/sconces/etc. Another different style choice we went with was not doing traditional baseboards in our bathroom. We extended our flooring tile to the baseboards. *We went with larger size Carrera porcelain from Floor & Decor. I love the extra storage shelf under the vanity! I keep extra towels underneath along with a basket filled with toiletries, blowdryer, curling iron, etc. I think it makes a huge difference to have a vanity with open bottom space in a smaller bathroom. It makes it feel less clunky and heavy in such a small space. Our towel hangers along with toilet paper holder are from Anthropologie. I loved the little extra detail they had and that they all matched the remaining brushed brass fixtures. Our sconces are from Door Corner and on sale for $34! Linking them here! 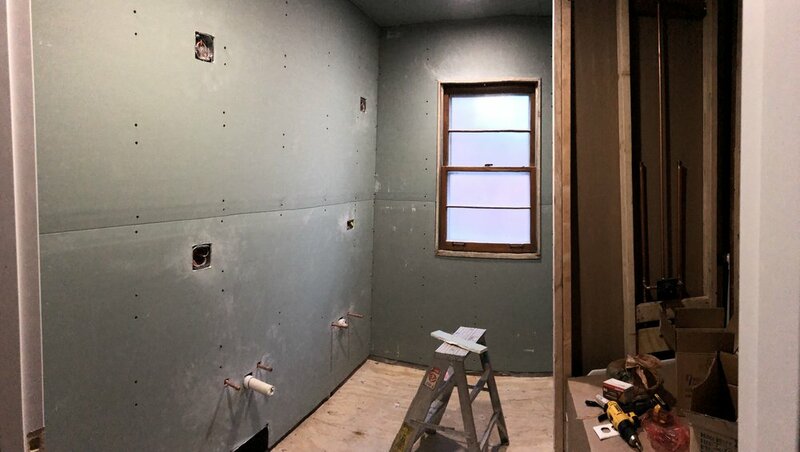 The largest cost of our bathroom remodel was the updated plumbing, building materials and labor. My dad is a plumber so we lucked out BIG time on costs for our plumbing. Initially if you were to replace all the plumbing in your household and remodel a bathroom you’re looking at around $15,000 if not more. The least costly of our job for this bathroom was the tile and vanity. Our tile costs would have been estimated at around $600-700. Our vanity came with pre installed fixtures but they didn’t match well with the Kohler Purist faucet. We replaced them all with the Cosmas brand fixtures that you can purchase on their website or Amazon. Our mirrors we found on Amazon for a steal. It was a little bit of a pain installing one of them because of the placement of the electrical wiring. One of those little details you forget about. Eventually I would love to find an additional cabinet or a feature to put in the empty space between the vanity and the doorway. We are so happy with how everything turned out! Our next project is our garage and backyard so follow along for some fun updates within the next couple weeks!